영어에서는 gave가 give 동사의 과거형이겠지만, 대문자 GAVE는 내시경의사에게 매우 중요한 질병입니다. 1953년 Ryder라는 분이 고령여성의 위절제 표본에서 'erosive atrophic gastritis with marked venocapillary ectasia'를 보고한 것이 최초의 진단이었습니다. 흔히 "prominent erythematous stripes radiating in a spoke-like fashion from the pylorus to the antrum"이라고 기술되어 있지만 (이런 모양 때문에 Jabbari는 같은 condition을 watermelon stomach이라고 부르기도 했습니다), stripe가 아니라 불규칙하게 산재된 발적처럼 보이기도 합니다. 따라서 antral gastritis라고 잘못 진단되기 쉽습니다. 전정부는 심한 발적이 있고 위체부는 정상이면서 그 경계가 비교적 뚜렷한 것이 특징입니다. 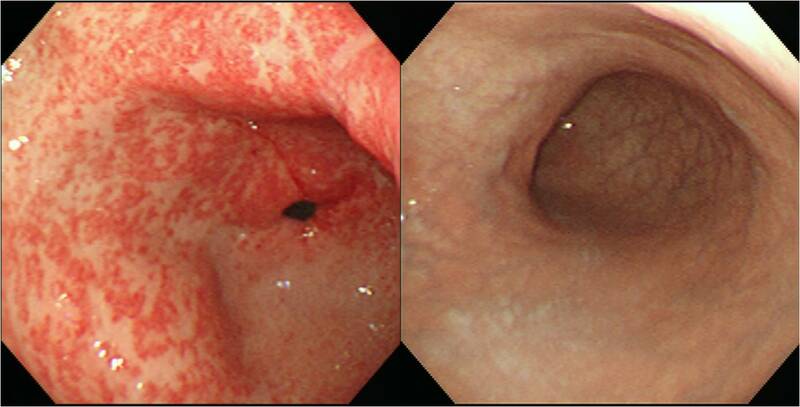 GAVE (gastric antral vascular ectasia)은 만성 위장관 출혈과 빈혈을 일으키는 원인입니다. 고령에서 많고 여성에서 약간 더 흔하면서 간경화를 동반하는 수가 많습니다. 대부분은 occult blood loss에 의한 만성적인 철결핍성 빈혈로 병원을 찾지만 간혹 overt gastrointestinal bleeding을 일으킬 수 있습니다. 유문으로부터 방사형으로 뻗어 나온 확장된 혈관 조직이 줄무늬로 보이는 병변으로 수박위(watermelon stomach)라고도 불립니다. 그러나 chronic superficial gastritis에서 관찰되는 pyloric ring을 향하여 종주하는 hyperemic strand와는 뚜렷하게 구분됩니다. GAVE에서는 줄무늬가 아니라 전정부의 불규칙한 미만성 발적으로 보이기도 합니다. 그러나 근접해서 관찰하면 확작된 혈관임을 알 수 있습니다. 전정부에는 심한 발적이 있는 반면 위체부는 정상이면서 그 경계가 비교적 뚜렷한 것이 특징입니다. 진단을 위하여 조직검사가 필요한 것은 아니지만 조직학적으로는 "usually show fibromuscular hyperplasia of the lamina propria, intravascular fibrin thrombi and an increase in the mean cross-sectional area of the lumen in mucosal vessels"과 같이 기술되곤 합니다. 레이저 광응고술, 양극 전기 응고술, 열탐침 응고술, 주사 경화요법 및 아르곤 플라즈마 응고술 (APC) 등이 병변과 출혈을 치료하는데 사용되고 있습니다. 저는 argon plasma coagulation 장비를 이용하여 최대한 철저히 ablation하고 철분을 투여하는 방식으로 치료하고 있습니다. Gastric antral vascular ectasia (GAVE) is an unusual but interesting cause of chronic gastrointestinal blood loss and anemia. 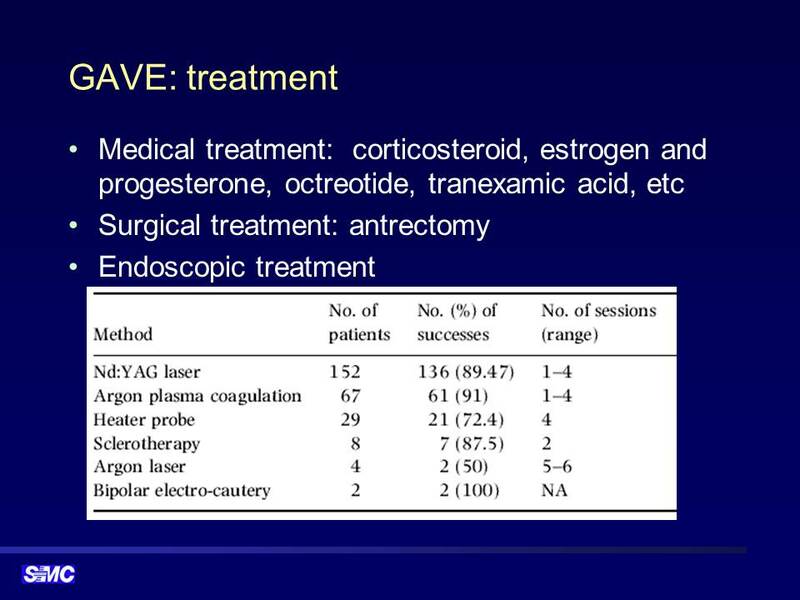 GAVE was first described in 1953 by Ryder in the gastrectomy specimen of an elderly woman, as 'erosive atrophic gastritis with marked venocapillary ectasi'. 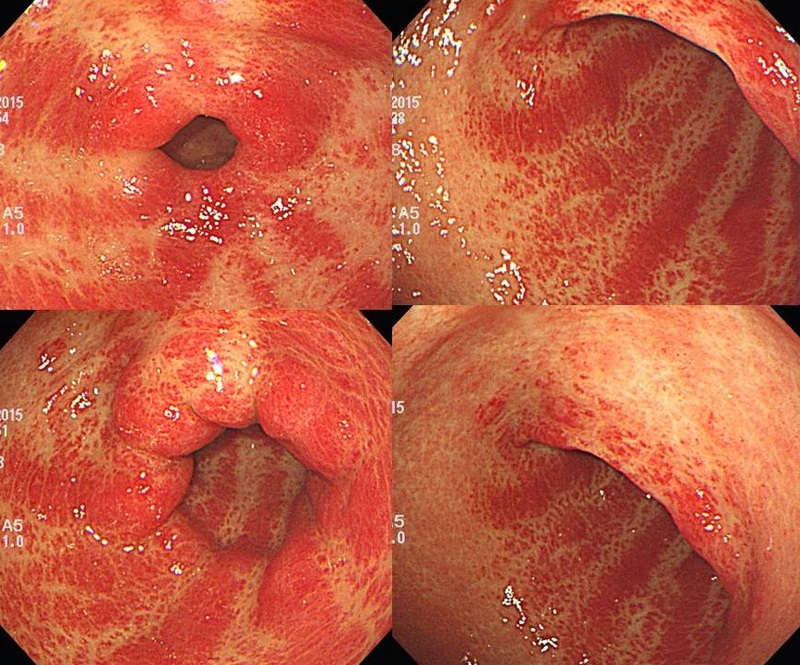 In endoscopy, GAVE has unique appearance characterized by prominent erythematous stripes radiating in a spoke-like fashion from the pylorus to the antrum. Jabbari called it as 'watermelon stomach. 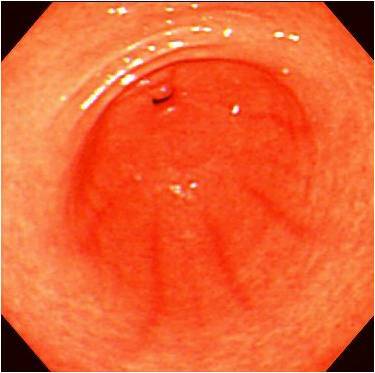 GAVE is commonly misinterpreted as antral gastritis. 교수님, 마침 오늘 EndoTODAY가 GAVE 여서 메일드립니다. 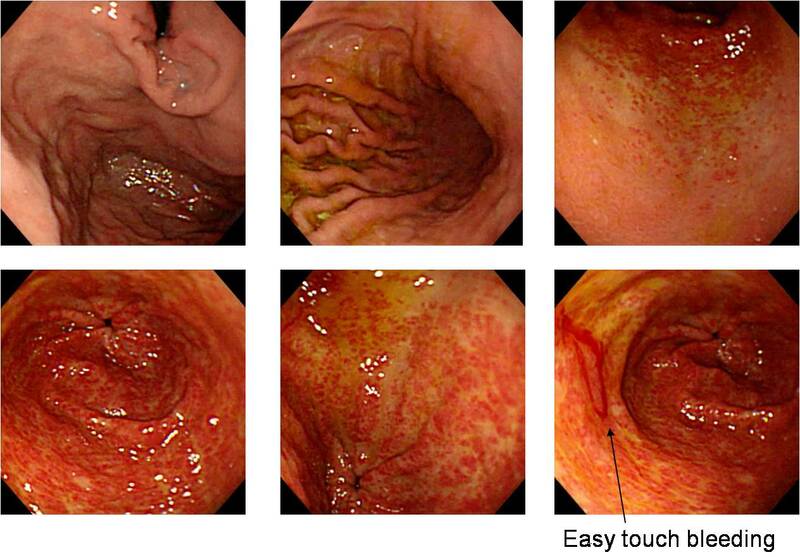 4년전 Maglingnant duodenal GIST 로 Roux en-Y 수술 받으시고, 이후 hepatic meta 확인되어 Gleevac 쓰는 분입니다. FFever, influenza로 응글실 내원하셨다가 갑자기 dark blood color 의 hematemesis 했다고 하여 EGD를 시행했습니다. 다음날 내시경에서는 active bleeding 없는 상태였습니다. GAVE라고 생각되는데 추가적인 치료가 필요한 GAVE인지 문의드립니다.